In December 2010, Gibson Guitar will release a reproduction of Eric Clapton's iconic 1960 'Beano' Les Paul. 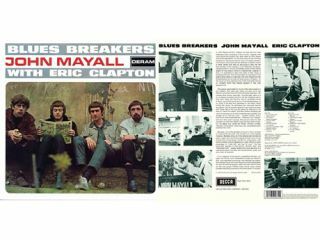 One of the most important instruments in the history of rock and blues, the guitar gained its nickname because of its appearance on the groundbreaking 1966 album, John Mayall And The Bluesbreakers Featuring Eric Clapton, on the cover of which Clapton is famously reading a copy of the British comic The Beano. Regarded by millions as the Holy Grail of all Les Paul Standards from the hallowed 1958-60 period, the sound of Beano in combination with Clapton's Marshall JTM45 amplifier (itself later referred to as the Bluesbreaker) is still one of the most sought-after tones amongst guitarists across the globe today. Such was the level of devotion at the time that fans even scrawled 'Clapton Is God' on walls all over London. During the recording of the Beano album in the spring of 1966, Clapton removed the nickel covers from the PAF humbucking pickups on his Les Paul, giving it a distinctive look. The guitar was stolen in July of that year, just as the iconic Bluesbreakers record was released. Speculation still abounds as to the instrument's whereabouts. We'll have more news about the Gibson 'Beano' Les Paul reissue soon and we expect to get our hands on one in January at the Winter NAMM 2011 show in California.